There are often questions about what a simulation software program can and cannot do. How comprehensive is it? Can the program consider all of the real complexities of the entire process of a sequential multi-shot injection molding, including the mold components, cooling channels, runner systems and geometric descriptions of the mold, or is it limited to using assumptions such as boundary conditions? SIGMASOFT® was developed to provide simulation solutions that are applicable to today's complex design-for-injection molding processes, such as two-shot molding where the first molded product becomes the substrate for the second product, as well as three, four, five - or even more - sequential molded shots combined to create the final product. By allowing companies to virtually examine 'what-if' scenarios on every project, SIGMASOFT® reduces the need for prototypes and tool reworking, helping businesses bring products to market faster while reducing costs. Controlling the mold surface temperature is critical to profitable molding, yet sufficient attention is rarely given to this aspect of multi-component injection molding. Most simulation programs consider only the water line temperature, rather than the temperature of the mold itself, and assume that adjustments to the water line temperature will uniformly affect the mold. In multi-shot molding, the heat from the first component is critical because when it's too high, the colors bleed together. 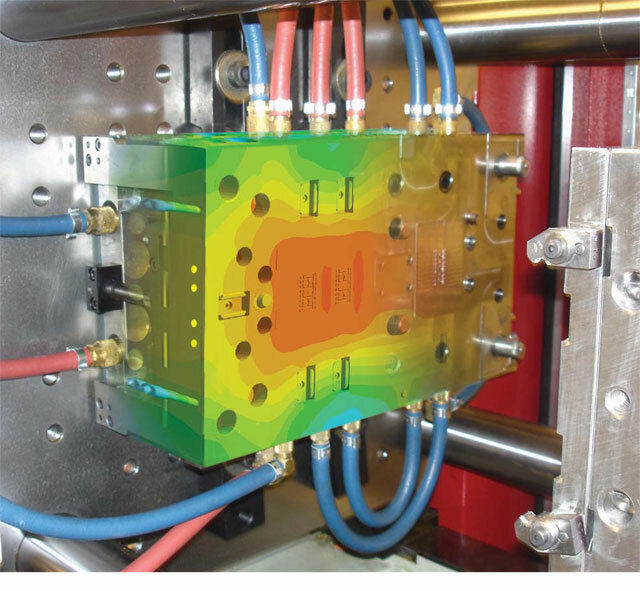 The ability to consider the mold surface temperature in a multi-component simulation is crucial to the successful production of the final product. When there is excessive heat in certain areas of the part and the mold cannot absorb it, these areas will solidify more slowly, are isolated from packing and tend to shrink more. For example, transparent areas may be frozen while colored areas are still liquid. These isolated areas will also tend to sink and may have voids, which, in turn, create gaps which the second shot of material may flash over. SIGMASOFT® allows the engineer to identify these problem spots, investigate the root cause underlying the problem, and adjust the design or the process to correct the issue before the part goes into production. In the manufacture of, for example, a toothbrush, the bristles are placed into the mold and the first component is injected to encapsulate them. A positive bond between these two components is critical to ensure the bristles don't fall out: after all, what good is a toothbrush without bristles? In order to ensure this bond, the simulation needs to calculate the amount of heat exchanged between the mold and the bristles, and between the bristles and the first shot. If the surface temperature is too low when the polymer arrives at the bristles, bonding will not be sufficient. The virtual production model automatically calculates the exchange of heat between all of the components throughout the complete cycle. The multi-component simulation model must also consider the matter of air entrapment within the cavity. Fine detail areas, which may not fill completely during the first molding cycle due to the presence of entrapped air, can leave an opening for the second shot of material. Large vents can be placed throughout the mold to reduce air trapped within the cavity, but the possibility for flashing during filling increases dramatically. Using a comprehensive simulation tool allows for the optimal placement of appropriately sized vents in order to accommodate higher filling pressure without flashing the part.